On Aug. 10, Shawn Williamson put out his family’s first bag of trash in 26 months. That’s right, 26 months and just one bag of trash for Williamson, his wife, Monica, and their 7-year-old daughter Alyssa. The Brooklin family recycles, reuses or composts 99.3 per cent of their waste, Williamson calculates. “It’s easier and cheaper,” says the management consultant, who specializes in environmental challenges. There are only two other small garbage containers in the home. But there are plenty for recycling, composting and a couple of large containers destined for the Goodwill donation centre. It all starts at the store, especially the grocery store. Buying pre-packaged and ready-made food not only creates a lot of trash, it is much more expensive and less nutritious than buying fresh. The Williamsons hit the supermarket once a week with their 12-year-old green plastic baskets and preprinted shopping list, with the weekly essentials listed to make shopping more efficient and eliminate impulse buying. They also buy in bulk. Toilet paper comes from an office-supply outlet in a giant box that barely fits in the car. Staples such as rice come in 50-pound bags. The house is outfitted with more shelving than most homes but Williamson insists it doesn’t look like a warehouse. “Try eating only fresh for a few weeks and you’ll see a health improvement . . . you’ll feel better,” Williamson says. When the family does order takeout, they bring their own plastic containers. “We bring the big ones and the take-out places tend to fill them up for the same price.” Most of this is just common sense on how to be more efficient, and Williamson believes it has saved his family hundreds of hours. “Just take a few seconds once a week to think about how to do something better and do it.” Before you know it, you will be living better, saving money and maybe losing a bit of weight, says Williamson. Nearly all food waste and organic matter goes into a back-yard composter, to be turned into rich top soil for the vegetable garden. Williamson says he gets a bit of a workout digging in the compost and he finds it very relaxing. And it beats driving to the gym. The Williamsons live in Durham Region, where 60 per cent of residential waste is now being diverted from the landfills in Michigan, where much of Ontario’s waste has been going for the past decade. But Durham and York regions are proceeding with plans to build a $230-million garbage incinerator in south Courtice, near Lake Ontario. To operate efficiently, the natural-gas-powered furnaces will need to be fed thousands of tonnes of garbage around the clock. That will take the emphasis off waste reduction and the need to improve recycling programs, says Shawn Williamson, whose family diverts 99.3 per cent of its household waste. What Really Kickstarted China’s Green Energy Revolution? I wrote this in 2004 for WIRED when China first announced it was moving away from coal as its primary energy source to green energy. Fascinating to look back and see that China had just 400 Mw of wind energy then. Today it’s world leader with 145 Gw or 145,000 Mw (a Gigawatt is 1,000 Megawatts). Interesting to see climate concerns were not the main reason for this build out. Enjoy. THE WORLD’S LARGEST wind power project will begin construction this month near Beijing, bringing green energy and cleaner air to the 2008 Summer Olympics and city residents coping with some of the worst air pollution in the world. The new wind power plant, located 60 miles outside Beijing in Guangting, will generate 400 megawatts when at full capacity, nearly doubling the electrical energy China currently obtains from wind. But that’s just the beginning. Last summer at a climate change conference in Bonn, Germany, China surprised many by announcing it will generate 12 percent of its energy from renewable sources such as wind by 2020. Pollution is part of the driving force behind China’s newfound passion for green energy, said Yu Jie of Greenpeace China‘s office in Beijing. “Acid rain blankets 70 percent of the country,” Jie said, cutting crop yields, damaging trees and making rivers and lakes too acidic to support fish. The country’s galloping economic growth over the past 20 years has meant enormous increases in electrical power demands, 75 percent of which come from coal. China is the world’s largest coal-consuming country and home to 16 of the world’s 20 most polluted cities on the planet, according to the World Bank. At least 400,000 people in China die each year from air-pollution-related illnesses, the World Bank reports. Pollution is not China’s only energy problem. It is also plagued by frequent and widespread power failures because its generating capacity cannot keep pace with industrial and consumer demands. The country leads the world in purchases of TV sets and other appliances. While China has low-quality coal in abundance, its transportation infrastructure cannot ship enough coal from the mines in the west to the cities in the east, said Jie. Electrical energy self-sufficiency is a crucial goal for the Chinese leadership, especially as oil imports soar to provide gasoline for the 14,000 new motor vehicles being added to its streets every day. These factors have pushed China to invite Western energy experts, including environmental groups like Greenpeace and the National Resources Defense Council, to help China become more energy-efficient and figure out how to produce 20,000 megawatts from wind by 2020. A megawatt is a million watts, sufficient power to light 10,000 100-watt bulbs, or enough daily electricity for 600 to 1,000 households, depending on energy use. Germany currently leads the world, generating 12,000 megawatts from wind, with the United States well behind at 5,000 megawatts. “China’s wind power potential is huge — 500,000, perhaps 600,000 megawatts — but it needs the proper legal framework,” said Corin Millais, executive director of the Brussels-based European Wind Energy Association. The association has contributed input on the Chinese renewable-energy law. China has a complex mix of state, local and private energy generators, with multiple levels of subsidies and often conflicting regulations. “Changes in state and federal laws are needed, along with clear rules about who sets the price and who owns the wind power farms; otherwise the wind-energy boom won’t happen,” said Millais. The Chinese want to pursue private-public partnerships with European companies, but because up to 80 percent of the total cost of a wind farm is building it, companies need a reliable price structure for the power they sell, he said. The new law is expected to be in place by next summer, and if it has the right ingredients, the Chinese landscape will soon blossom with fields of 2- and 3-megawatt wind turbines. Another reason China is looking to wind is because it is now as cheap as coal, said Kyle Datta, managing director at Colorado’s Rocky Mountain Institute, a leading independent energy research center. And if the health costs associated with coal burning are considered, wind is actually a lot cheaper, said Datta, who researched the Chinese energy market while co-authoring a book, Winning the Oil Endgame: American Innovation for Profits, Jobs and Security. “People in Chinese cities would also prefer it (wind energy) to all those diesel generators they needed last summer just to keep the lights on some of the time,” Datta said. Solving China’s pollution problems while meeting its energy needs will be difficult and will require a mix of power-generation technologies, including biomass, solar and hydro, he added. Although China has little interest in nuclear power because of its high cost and security concerns, a few more nuclear plants will also be built, Datta said. The original headline of the article said we had 5 years but now it’s less than 2 years to stop building any new stuff that uses fossil fuels. Here’s lightly updated repost. By 2018, no new cars, homes, schools, factories, or electrical power plants should be built anywhere in the world, ever again, unless they’re either replacements for old ones or carbon neutral. Otherwise greenhouse gas emissions will push global warming past 2˚C of temperature rise worldwide, threatening the survival of many people currently living on the planet. 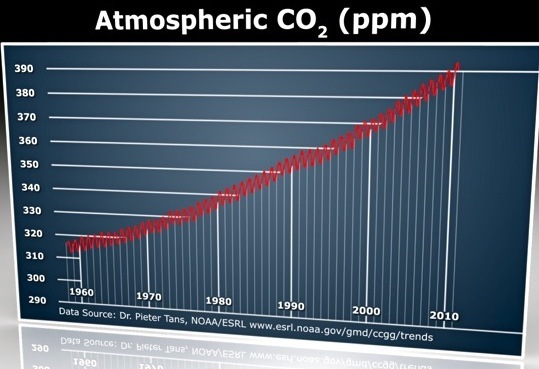 Paris Climate Talks – Peak CO2 Already? Have We Reached the Crucial Peak in Global CO2 Emissions? New report released today says CO2 emissions will likely decline this year for the first time after growing 2-3% per year for last 15 years. COP21 delegates received the updated negotiating text of a potential Paris Climate Agreement (ADP Draft Agreement) wednesday. Still too long at 50 pages and 208 brackets (disputed text/issues). That tweet could have been made at every COP since Copenhagen in 2009 The new major economies (Brazil, India) and developing countries want to see more of the billions of dollars rich countries promised in Copenhagen to help countries adapt to climate impacts and reduce their own emissions. So far only about $30 billion has been transferred from north to south since 2010. The Green Climate Fund is a new mechanism to receive and dole out this cash but it was practically empty in 2014. One of the breakthroughs in Lima last year was a commitment by rich countries to put the bare minimum, $10 billion, into the fund for 2015. It has been an annual struggle to get the money that’s supposed to become at least $100 billion annually by 2020. It is even harder to determine if this is new and additional money — not re-directed foreign assistance — as promised. In Paris, finance will be a major issue. It is hard to see developing countries signing a new climate agreement without clear commitments and details about how the Fund will be replenished and reach $100 billion a year. Cars and trucks are extraordinarily expensive. 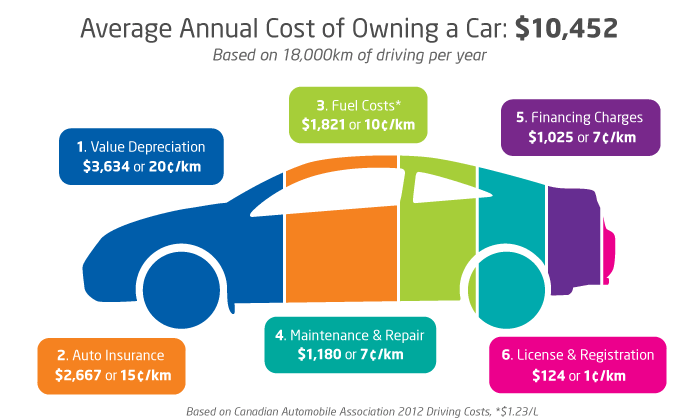 The full cost of driving 100 km is between between $50 and $75 when fuel, wear and tear, insurance, depreciation, and repairs are included. The cost of owning and operating a car, van, SUV or truck ranges between $9,000 to $15,000 a year depending on the purchase price of the vehicle according to automobile clubs like the CAA . That’s a big chunk of aftertax income spent each and every year. Double this for two-car families. If you pay $50 at the pump about $33 will go directly to oil companies. The gas station gets around a dollar and the rest is for provincial and federal taxes. Finally ask yourself how many hours a day your vehicle isn’t being used? Most are parked 22 hours a day. Why not give your car a day off once a week? A ‘No Car Day’ is easy to do, saves money and reduces emissions of climate-heating carbon dioxide (CO2). The average passenger vehicle emits around 4.8 tonnes of CO2 a year. The biggest savings by far is to get rid of one vehicle. When you consider the full costs of ownership, the $9 000 to $15,000 saved will let you rent vehicles or taking taxi as needed with plenty of cash left over. For maximum savings use the bus or train. A bus from Uxbridge is only $10 to downtown Toronto — 75 km one way. Using your car that 75 km trip really costs $45 not including parking. New study – drive less lose weight guaranteed: If drivers nationwide traveled 1 mile less by car each day, not only would fuel consumption fall, but annual health care costs could drop by billions of dollars as fewer people would be classified as obese or overweight, Jacobson estimates. Cities are responsible for 70 per cent of global CO2 emissions but they can save the planet by greening one community at a time said Vancouver’s David Cadman at the close of the ICLEI World Congress 2015, the triennial sustainability summit of local governments in Seoul, South Korea. “We can do it. We must do it,” Cadman, the retiring president of Local Governments for Sustainability, told some 1,500 delegates from nearly 1,000 cities and local governments in 96 countries on April 11. The majority of climate actions and most plans to reduce CO2 emissions are happening at the city level, Cadman told DeSmog Canada in Seoul. Vancouver and 50 other cities have committed to 100 per cent renewable energy and 500 more are part of ICLEI’s Cities Climate Registry that documents verifiable CO2 emission reduction actions and commitments that amounted to 2.8 billion tons a year in 2014. Cadman, a former City of Vancouver councillor, has been president of ICLEI since 2006. It’s an international organization headquartered in Bonn, Germany, with 280 staff and 23 other offices scattered around the globe. ICLEI, which stands for International Council for Local Environmental Initiatives, started 25 years ago in Toronto to help cities become more sustainable. It now goes by the more manageable name of “Local Governments for Sustainability,” but still uses the original acronym. Canada’s federal and provincial governments were very strong supporters in the early days but the past decade has been very different. “We seem to be chained to the fossil energy industry in Canada and it’s pulling us down. Cities and organizations can hardly dare to speak out about this now,” he said. Germany was only too happy to bring ICLEI to Bonn eight years ago and has been generous with its support, along with the European Union. Now the organization is experiencing what is being called an “Asian pivot,” with the mayor of Seoul, Park Won Soon, as the new president. 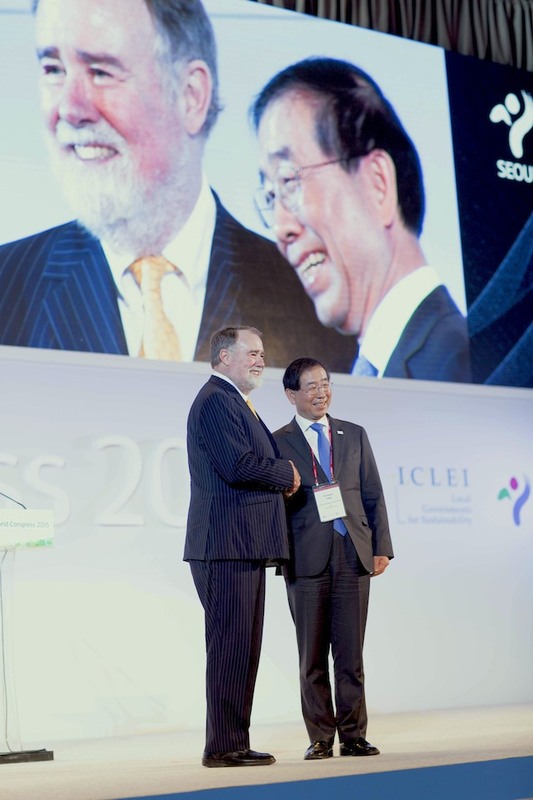 Park has helped Seoul to become one of the world’s leaders on sustainable development. With 11 million people and growing fast, Seoul will reduce its energy use and increase renewable generation including rolling out 40,000 solar panels to households by 2018 and 15,000 electric vehicles. By 2030, CO2 emissions will be cut 40 per cent. “Action on climate will be by local governments no matter what national governments decide,” Park Won Soon told DeSmog Canada. “We need to act quickly, we need to act energetically,” the mayor said. China’s megacities are also joining ICLEI. At the congress, Hailong Li, deputy secretary general of the China Eco-city Council said the country will have 100 low-carbon eco-cities by 2017. That will drive down the costs of energy efficiency and renewable energy, Li said. China also intends to become an expert on eco-construction and to market its expertise to the rest of the developing world. By 2030 another 3.5 billion people will be living in cities so it is absolutely critical that the infrastructure be sustainable said Cadman who will continue to be active as special representative to the new ICLEI President. Canadian cities could also do more and sooner if they had the support of provincial and federal governments, he said. That may be changing at the provincial level with growing support for various forms of carbon taxes that will help generate funds and financial incentives to reduce emissions. Fossil fuels are in decline — divestment is taking off and investments are shifting to renewable energy. There’ll be no pipelines to the West Coast and no new investments in the oilsands, Cadman said. Even in B.C., the hoped-for markets for LNG may not exist with China building gas pipelines to tap reserves in Iran and Russia, he said. Blame Canada For Overheating the Planet? Climate change represents an era of change in economics -- Climate Change Economicsis a clearinghouse of info/comment to help navigate the risk and the opportunity. Revised 25-page eBook a collection of the best bits from 4 years of articles on science of hurricanes and global warming. i.e. Hurricane Katrina was only a Category 1 or 2 on landfall.